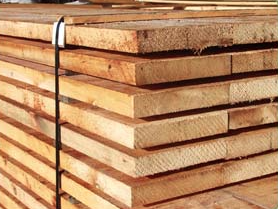 The traditional rule-of-thumb for air-drying lumber is to allow one year of drying time per inch of wood thickness; this adage obviously only takes a few variables into account, but it’s a rough starting point in understanding the time investment required in order to properly air-dry lumber. Lumber dries quickly on the outside and progressively slower as you move inwards. If our paddle boards were made out of 1″-2″ think lumber I would recommend kiln dried lumber, as it wouldn’t be practical to wait the 1-2 years required for air-drying. While there are various types of kilns used to dry lumber, the basic premise is usually the same: a large insulated chamber or room is used to balance and control humidity, temperature, and airflow to safely and efficiently bring wood down to an acceptable moisture content. The main advantage of a kiln is that with the increased temperature and airflow—all while carefully maintaining and controlling the ambient humidity—the wood can be dried much more evenly, minimizing any sort of moisture gradient between the outer shell (which dries very quickly) and the inner core (which slowly equalizes moisture with the shell). Thus, a kiln is able to dry wood much more evenly to an even moisture content (EMC) and it’s this uniformity in drying that allows it to also dry the wood quickly. I always air-dry all my lumber. I try to mill enough lumber for 3-6 months production but have used wood in as little as 1 week. Try to pick lumber that is fairly dry to begin with. You can tell approximately how dry wood of the same species is by the weight. It helps to use a simple moisture meter while you shopping to avoid any really waterlogged boards as they have the most potential to warp, twist, crack while drying. Process the boards in a timely fashion. It’s best to process the boards into usable rough-cut lumber as quickly as possible; doing so will speed up the drying time. Cut the wood slightly oversized. Remember that wood shrinks as it dries. This, along with the material that will inevitably be lost when the boards need to be jointed/planed smooth, mean that green wood should always be cut larger than the desired finished size. You usually don’t need to bother jointing/planing the wood prior to drying, since it will no doubt distort at least slightly during the drying process, and the edges should be dressed after the wood has dried. Sealing the ends is usually recommendedwhen you read about drying lumber but again it is not that important with the thin boards you will be using. It is important to remember that moisture escapes from wood about 10 to 12 times faster on the ends than through other surfaces so you will end up with end grain checks—a very common drying defect. If you know in advance you will be trimming the ends of your boards it is not really a problem. Add a few inches to your required length and then trim the ends after the boards are dry. Stack and sticker. Having lumber of uniform lengths and thicknesses greatly simplifies the stacking process; once the board is sawn up into planks of satisfactory dimensions, it’s crucial to stack them in such a way that they will be exposed to air on all sides—stickers are typically used for such a task. Stickers are small pieces of wood (usually about 1/2” x 1/2”) that are used to add space between sawn planks, which increases ventilation and aids in a more uniform drying process. Space stickers as required; a conservative spacing scheme would be every 24”. It is important that stickers line-up vertically and they are on level ground. If you stack the wood with a twist, it will dry with a twist. Add some weight. Once the stack of wood is stacked and stickered properly, it’s helpful to add weight to the stack. The lumber at the bottom of the stack is probably weighed down sufficiently by the wood on top of it, but boards near the top benefit from added weight. Weighing the stack of wood down also helps to prevent warping or distortion, which is especially important during the initial drying phase. Neatly and properly stacking, stickering, and weighing wood will go a long way towards ensuring your effort will result in flat, stable, and usable lumber. Add heat once EMC is reached. It’s important not to rush the drying process too quickly, but once a wood pile has safely reached EMC, it may be necessary to bring the moisture content down even further by adding heat. This can be as simple as moving the lumber stack inside the house for a few days or turning up the heat in your workshop.